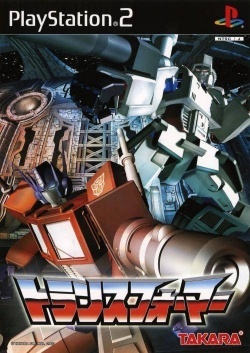 Game description: The game allows players to select a side (either Autobot or Decepticon). The Autobot side stars Optimus Prime, Jazz and Wheeljack, who are later joined by Rodimus Prime, Arcee and Kup. The Decepticon faction begins with Megatron (referred to here by his Japanese title Emperor of Destruction), Starscream and Soundwave with Galvatron, Cyclonus and Scourge joining them later on. Other Transformers are unlocked as the game progresses and join their respective factions. These Transformers include such Generation 1 stalwarts as Ratchet, Bumblebee, Hound, Astrotrain, Blitzwing and Shockwave. Later additions from the Transformers movie, such as Springer and Ultra Magnus, also appear. A number of characters from the Japanese exclusive series The Headmasters make appearances as well, notably the Trainbots and Sixshot (who is portrayed as a powerful ninja warrior as he was in the Headmasters anime), also included were Dark Hot Rod (Black Rodimus) and Optimus Clone (Black Convoy). Crashes after intro IPU in hardware mode. Perfectly fine in software mode. Not to be confused with Transformers: The Game and Transformers.